Repairing a shower valve seems to be becoming a very common task. I was asked to repair this bath store thermostatic shower valve today. 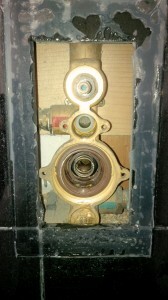 The valve was about 8 years old and had stopped delivering hot water. At the maximum hot setting the delivered water was Lukewarm at best. b. the thermostat in the valve is faulty. The best thing to do is make sure it isn’t problem a. before you try to order a new thermostat. This valve didn’t have an instruction manual but most are fairly easy to do without. If you can see a brand on the valve it is worth going on the manufacturer website to download the manual before you start taking it apart. When repairing a showoer valve the first thing to do is remove the handles. With most of them you need a small allen key. Then remove the face plate. It will have silicon behind it so slide a knife blade behind and cut around if you can’t pull it of easily. Removing the handle reveals a philips screw. There are 2 washers. Be careful not to drop them in the wall cavity as you remove the screw. 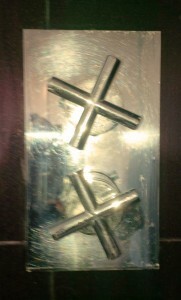 The final chrome part of the handle can be unscrewed in an anti clock wise direction. You will now see two access covers to the hot and cold filters. To open these remove the central screw and then turn anticlock wise. I did this using a pair of long nose pliers. I put the points into the two holes and turned. Use the long nose pliers to pull out the internal parts and filter. Remember how they come out. They will need to go back in the same way. You can then flush this by turning the water back on for about 5 seconds while holding a bucket in front of the valve. Reassemble the valve and test. If this hasn’t worked you will need to try to track down a new thermostat. I was lucky. Although there was no obvious debris in the valve this seemed to fix the one I worked on. When you put the handle back on the thermostat you will need to readjust the maximum and minimum temperature delivered. You do this by turning the central spindle while the handle is of. Left for hotter and right for colder.